The 2016 US-Canadian Mediumwave Pattern Reference for all stations is now available. Find the download link at upper right. Remember, the links change each time a new set is uploaded. Always look to this RADIO-TIMETRAVELLER site for the current link. Download is 54 MB. This year the Critical Hours plots have been split off to their own map set. Unlimited, Daytime, Nighttime, and Critical Hours plots are now compressed into one download. Plot data has been derived from the FCC's January 20, 2016 database. Be sure to see the readme file for detailed information. 1. Individual station plots can be turned on or off by a checkbox. Click the station flag and you will see the option in a pop-up balloon. Check or uncheck the box, then click the ReDraw button. Be sure to click the ReDraw button! 2. The entire plot set can be turned on or off by the All Plots/No Plots buttons. 3. Additional information has been added to each station's flag tooltip. Now included are FCC facility ID, engineering (application) ID, and distance of the station from the home location. The home location is user changeable, as before. 4. Skywave calculations have been updated and made more accurate. The latest ITU formulas are used. 5. Unlimited, Daytime, and Critical Hours plots are at the 1.0 and 0.1 mV/m levels. Skywave is at the 0.2 mV/m level. In all cases except for the nighttime graveyard stations, levels have been chosen to minimize pattern overlap and to more closely follow those which might be helpful to the mediumwave DXer. Included is a complete set of GoogleMap-based, HTML-driven maps which show the most current pattern plots of all licensed US and Canadian mediumwave broadcast stations from 530 - 1700 KHz. The set includes all frequencies for the indicated services: Unlimited, Daytime, Nighttime, and Critical Hours. Individual maps are grouped by channel frequency: 540, 550, 560, .. 1700 KHz, etc. Data for the plots in this offering is based on the current FCC and Industry Canada databases available at the time of its creation (January, 20, 2016). The daytime map series, in two parts, shows expected groundwave coverage patterns for Unlimited and Daytime (part 1), and Critical Hours (part 2) operations. New for this year, daytime signal patterns represent groundwave coverage at two levels, out to the 1.0 and 0.1 millivolts per meter contours. The change in levels was made in order to more closely match those which might be helpful to the mediumwave DXer. Note that daytime reception of signals out beyond the depicted 0.1 mV/m pattern is very possible, and in fact likely for the DXer. The contour line represents a signal strength at the station's extreme fringe distance, a level usually received on a sensitive portable radio with a low ambient local-noise level. I have chosen this signal level to give a good representation of what can be received by most DXers during sunlight hours. Also included in the daytime map series is a web-based HTML table listing all daytime stations in the US and Canada. It has clickable links which will take you directly to the FCC pages for that station (US stations only). 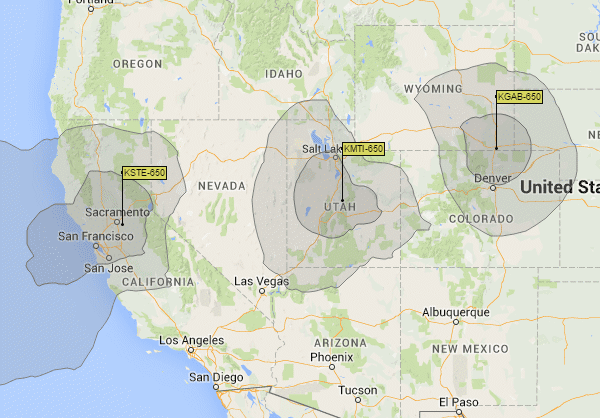 The nighttime map series shows expected skywave coverage patterns for Unlimited and Nighttime operations. Nighttime signal patterns represent the standard SS+6 (sunset plus 6 hours, or approximately midnight), 50% signal probability at 0.2 millivolts per meter. Note also that nighttime reception of signals out beyond the depicted pattern is very possible, and in fact quite likely for a skywave signal. The maps represent a signal strength between distant and fringe, a level generally easily received at night on most portable radios. I have chosen this signal level to give a good representation of what should be fairly easily received by most DXers on an average evening. The nighttime signal probability of 50% means that the signal will be received at this level approximately 50% of the time at that location for the sunset+6 hour time. Also included in the nighttime map series is a web-based HTML table listing all nighttime stations in the US and Canada. It has clickable links which will take you directly to the FCC pages for that station (US stations only). Using the actual FCC database files, Radio Data MW will auto-generate an interactive HTML pattern map, showing the pattern plots for all stations included at the discretion of the user. A complete set of mediumwave pattern maps can be generated in about three hours of processing time. Radio Data MW generates a real pattern plot based on ground conductivity, ground dielectric constant, and can display actual (but approximate of course) signal level boundaries for Local, Distant, Fringe, Extreme mV/m levels, or any custom mV/m level chosen by the user. A pattern plot for each station is generated and displayed. Each pattern is calculated using standard formulas used by the FCC or ITU to compute the base values at one kilometer, and field strength formulas at distance based on the works of many people over the years. See Field Strength Calculations: A History and Field Strength Calculator One, previously posted on RADIO-TIMETRAVELLER. Additionally, and new in 2016, individual station plots can be turned on or off by a checkbox. Click the station flag and you will see the option in a pop-up balloon. Check or uncheck the box, then click the ReDraw button. The entire plot set can also be turned on or off by buttons at the top of the map. Lastly, additional information has been added to each station's flag tooltip. Now included are FCC facility ID, engineering (application) ID, and distance of the station from the home latitude-longitude. Of interest to the DXer, by setting the home location latitude-longitude to your location and redrawing the map, each flag tooltip will have the distance from your location to the station.